I updated both my iPhone 4s and my third-gen iPad to iOS7, and everything worked fine. I think the default typeface is pretty light, making it a bit more difficult for those of us with older eyes, but it is a kind of a refreshing change…although it tends to look more “Windows-8-like” than I expected from Apple. But the apps seem to work fine. I’ve encountered no problems or speed hits. But, I have one issue not really related to the update: I am going to move up to a new iMac soon from my aging Mac Pro. I’ve done the research on how to back up the iPhone first, and all of that, but the process still seems very tedious and fraught with potential disaster. Does anybody have a good, simple way to do this? This little tiny thing is the Jawbone ICON HD + The NERD. I’ve not had good luck with hands-free audio for driving. I have a Plantronics Voyager Pro that works passably with my iPhone 4S until I put the phone in my pocket and start walking. Then it cuts in and out, every time. It doesn’t fit in my ear very comfortably and the sound is so-so. I’m doing a lot of long-distance driving, five hours or so at a clip, and I needed something better. I broke down and spent over a hundred bucks at Amazon on the Jawbone. And dammit, it was money well spent! The thing has “HD” sound – I don’t know what that means for a monophonic, one-ear headphone, but it so far is way better than any other phone headset I’ve ever used. My wife says call quality on the other end is good, too, although I haven’t tested it on the road in my noisy Chevy Equinox.I wouldn’t want to listen to music with it all day, but I could listen to audiobooks with it for a couple of hours at a time, I think. The NERD is the little USB dongle, obviously. 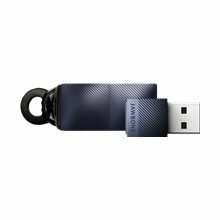 While it is a Bluetooth dongle, it is a dedicated one – once you pair the Jawbone to it you can use it on any computer and it will still know to stay linked. And it can stream audio from the computer while you are waiting for a call on the iPhone, then it will switch to the iPhone when needed. That is way cool! The dongle does use up a USB port, but that’s OK with me because I don’t have to reinvent the wheel every time I want to connect it to the laptop. So far, I recommend it. We’ll see after I have it a while. I don’t know about battery life. The button layout seems smart and I can switch it from one ear to the other without too much trouble and without changing anything. I think it will make those long drives a bit easier. 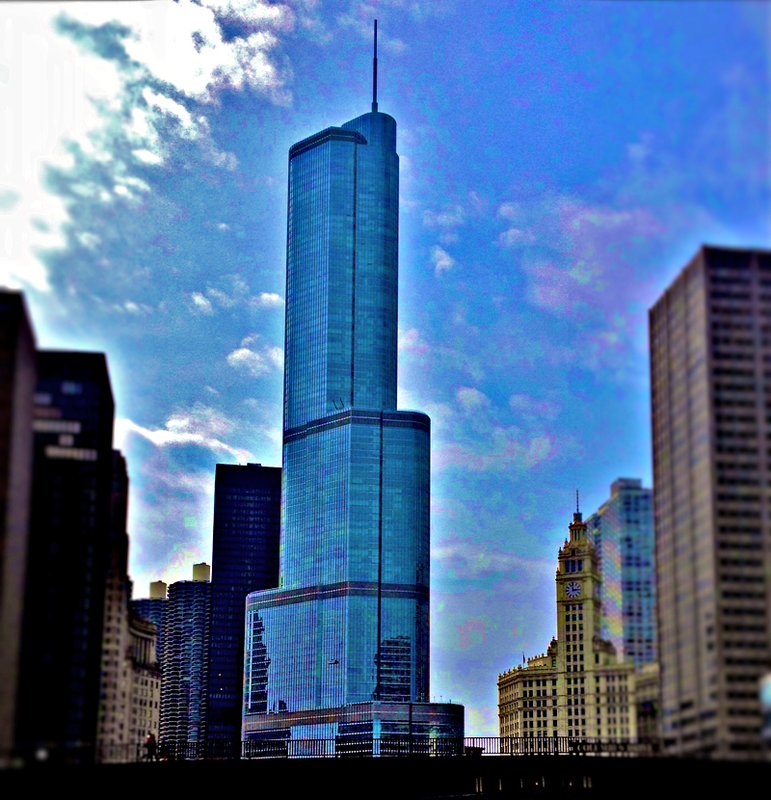 I shot this image of the Trump Tower last week while I was on the Chicago River on the Wendella Boats Architectural River Tour, which I recommend. I put it through an app called Focus (available at the Apple App Store) then adjusted it in Pixelmator (same source). I didn’t have any plan at all, just messed with stuff until I liked the look. I have no idea what I’m doing with these tools, and I assume folks who really know what they are doing could do something really special. I just liked how this one turned out – I think mainly because of the angle of the shot. Another Mac OX problem (apparently) solved! My desktop (well, under the desk) Mac Pro has been giving me fits for the last three or four months. I am running Mac OS X Lion 10.7.3. Everything else was fine – including email access using Thunderbird – but I was experiencing incredibly long load times for web pages.They were so slow that Google Chrome (yes, I was that desperate) gave me dialogs that said the page was stalled, even when it wasn’t. I did a lot of troubleshooting and research. It wasn’t an internet connection issue, or a DNS issue, or a firewall issue, or another of the dozen other things I thought it might be – I tried all of the fixes for those things. It was…caches. Apparently caches can be cleaned, and also can be “deep cleaned.” Too much inside-baseball for me. I thought I had cleared every cache I could find, but it looks like it wasn’t enough. I can’t seem to return to the forum where I found this tool, but once I ran Lion Cache Cleaner my problems went away. It does a bunch of other stuff as well, including repairing permissions, optimizing a bunch of stuff, and even checks for rogue rootkits. If you haven’t been updating your Mac system software lately, you run the risk of a malware attack from a trojan called OSX/Flashback.I. Here’s how to tell if your Mac is infected. There is also a new update to Java for OX X Lion (check your Software Update) that is supposed to close off the vulnerability. Yep, it’s a Java problem. Don’t say Steve Jobs didn’t warn you!